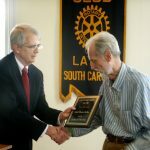 Abbott Shelley was named the Latta Rotary Club Citizen of the Year at their meeting on Tuesday, October 2nd. 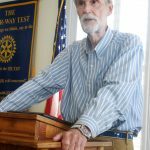 Marsden Cox, who presented the award, said it was a special day in the Rotary Club year because they have the opportunity to recognize a group or individual who has done many good things around town. He said the only criteria for the award is exemplary service to the Latta community. Cox said past winners had been instrumental in getting things done, and the town had benefited from their work. Several of the past winners were in attendance at the meeting. This is the 27th consecutive year that they have presented the award. Cox announced that Abbott Shelley was the 2018 winner of the award. “Commitment, dedication, and service” are the words that come to mind when you hear the name, Abbott Shelley, said Cox. Cox said Shelley had a lifetime of service to the Latta community and sets the example to carry outward and onward. Cox read an e-mail from Shelley’s brother, Perry, in which he said Shelley loves Latta and his church. A. Lafon LeGette, Jr., who said he had known Shelley since he had been in Latta, said he knows of no one who loves Latta more than Abbott Shelley. He mentioned that Shelley was a member of the Dillon County Historical Society. He said when the Latta Revitalization Commission held their clean-up days that Shelley always participated and even when it was over with, one may see him just picking up trash in the downtown area or Veterans Park. LeGette said Shelley was a loyal member of the Latta Rotary Club. 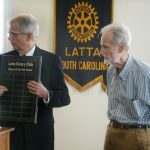 LeGette said he cannot emphasize enough what an outstanding citizen of Latta, Dillon County, and the Pee Dee that Shelley is and said he wished there were more like him. Gerald Berry said he became friends through the Latta Community Choir. He also spoke highly of Shelley and presented him with a gift. Paul Gasque said Shelley had a heart for people. He said it is the little things that one does along the way that make a difference in the lives of people. O. C. “Corky” Lane, Jr., said Shelley was a sweet man who is always doing things for other people. He said Shelley’s humbleness was hard to believe and that he deserved every accolade that he had received. Cindy LeGette noted that Shelley had a “silver tongue” and a prayer rolls right out of his mouth. Shelley was very appreciative to be awarded this honor. He said it was a blessing to be in Latta along with other comments. Shelley will appear on the Latta Rotary Club calendar and will be the grand marshal in the Latta Christmas Parade on November 30th.